First, a bit of terminology clarification. Because when I get home from work my real objective is to get through everything I need to get through (dinner, walking the dog, time with kids, gym, prep for the next day, etc.) as quickly as possible so that I can be reunited with my favorite thing in my whole entire house: my bed! 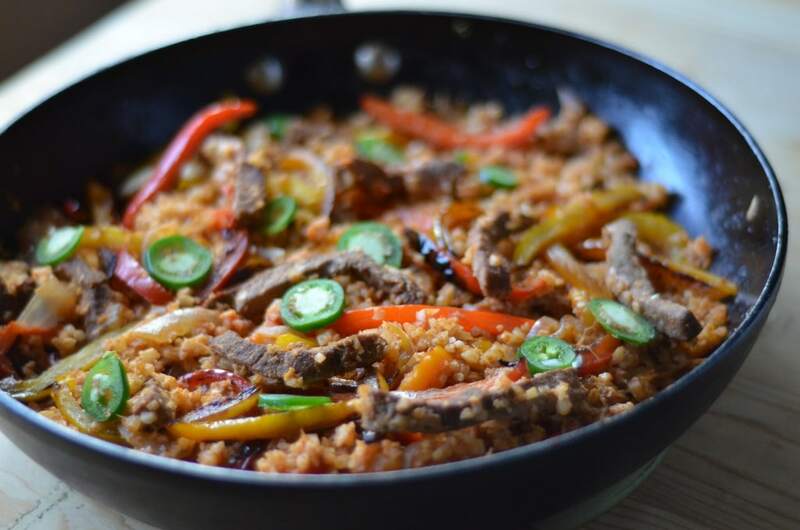 This fajita skillet is one of three dishes I demo’d during my Easy Weeknight Meals cooking class in September 2018. This is the absolute weeknight version, but if you have problems with steak, I would suggest using my meat marinating technique the morning of (you don’t have to slice the steak, just toss it in the marinade) and you’ll come home to a tender cut of meat ready to yield to your every whim. Now that my oldest daughter (La Grande Diva) is away at college, weeknight dinners are easier. This meal would have been a definite “No!” for her because of the bell peppers. (Oddly, she loves riced cauliflower though…I feel like if I could figure out her vegetable preference logic and the logic dogs use to know where they want to “go” when on a walk…I’d have the secrets to the universe! But I digress.) La Petite Diva, on the other hand, is a veggie-head like me. She is also a spicy-lover so she insisted on the jalapenos, with seeds, in the skillet. (My boyfriend took his portion before I added those, which is why I purposely blurred the back of the photo syou can’t see how much less there is in the back of the pan! 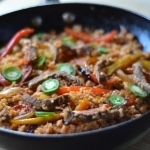 This recipe brings in all the yummy flavors of a fajita – the steak, the peppers, the onions, and pairs it with the zing of tomato paste, utilizing cauliflower instead of rice. And…it’s damn easy to make! Check it out! And if you need ideas for even more easy weeknight meals, consider investing in the entire class, available with replay. You get the entire video cooking class, along with a downloadable recipe booklet with full pictures and a shopping list! Check out the cooking class! Place a skillet over medium heat and allow it to get hot. Add oil. Saute onion, peppers, and garlic until softened, about 5-7 minutes. While vegetables are sauteeing, place steak strips in a bowl and toss with half of each kind of spice, along with salt and pepper. Add steak to pan and saute until browned. Reduce heat to medium-low and cover. Allow to cook about 10-15 minutes, stirring often. Taste and adjust seasonings. Top with jalapeno peppers, shredded cheese, diced avocado or desired toppings. The serving size is it a 1/4 cup or something different. I am struggling with serving sizes and I guess I need to know what u typically eat of this. Serving sizes are pretty subjective so knowing mine isnt really helpful to you. I usually eat about a cupful. But that doesn’t mean you can or should. Use your best judgment!